CHEQR DataBar Maestro by Dusty Wallet, Inc.
Are you trying to prevent coupon misredemption? Need to check GS1 DataBars for errors? Trying to identify and track barcode files? Want a cost-effective software solution so that you don't have to rack up vendor and consultant fees? 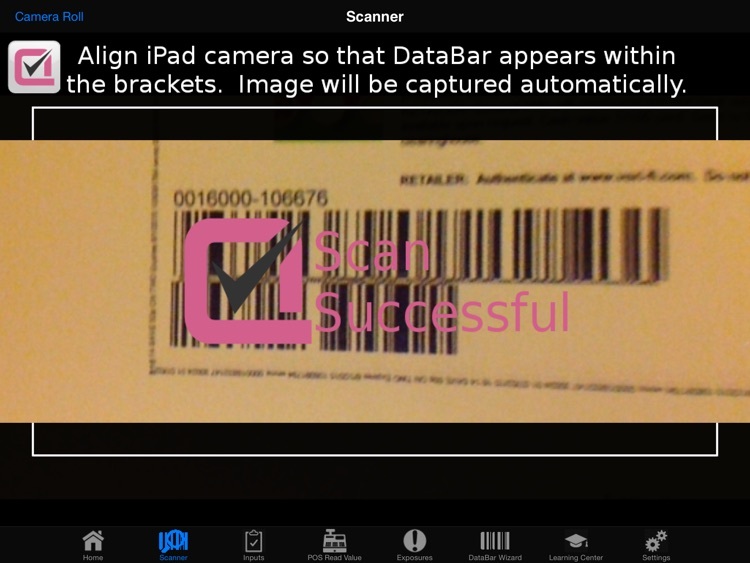 CHEQR Databar Maestro uses your iPad’s camera to scan a coupon, and then it automatically analyzes the DataBar. 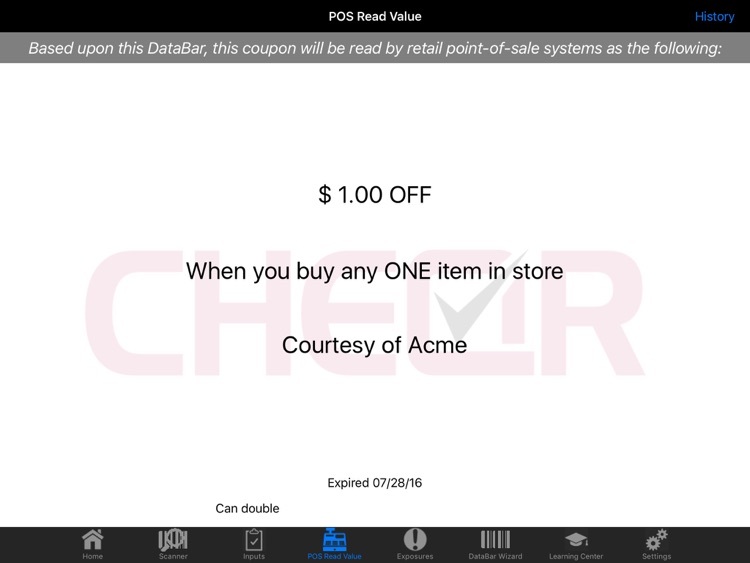 With no user set-up needed, CHEQR yields a proprietary interpretation of any coupon from the perspective of POS systems. Using patent-pending algorithms, CHEQR also identifies otherwise hidden exposures that enable or even foster coupon misredemption. CHEQR can retain the scanned images to facilitate audits, help manage complex promotions and market-specific offers, and aid in incremental DataBar refinement efforts. The truth is that the GS1 DataBars are extremely complicated. They're so complex that over 70% of current FSI offers contain some significant error, even those issued by premier marketing firms. And the stakes are extreme, with a national coupon drop representing an average exposure in excess of $500 million. Before CHEQR –pronounced like “checker” – coupon professionals had to hope that their DataBars accurately reflected the intended coupon terms. 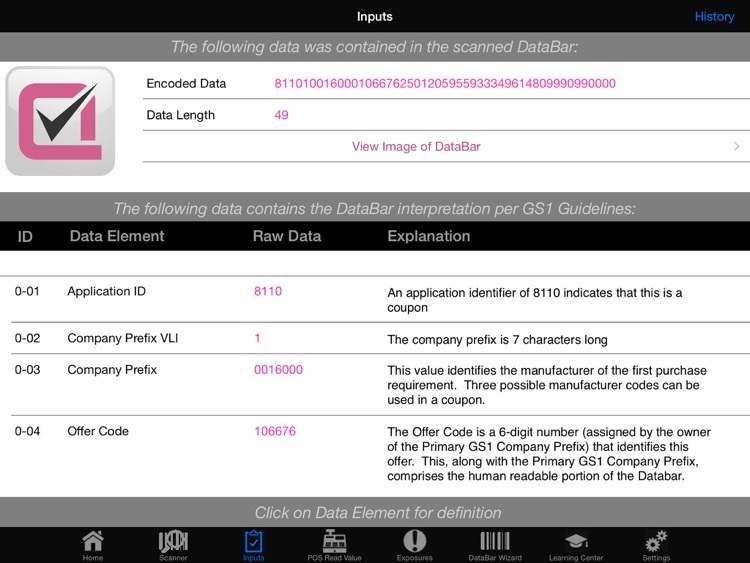 CHEQR demystifies the DataBar and reveals the encoded information in an easy-to-understand format. With CHEQR, you can match a coupon’s written terms to those embedded in the barcodes, isolate any conflicts, and learn how to close redemption gaps and loopholes. •CONVERTS DataBars. CHEQR reads the information in each DataBar, presenting it in multiple format options, and allowing you to match each DataBar with the intended data on a field by field basis. •EXPLAINS DataBar Settings. 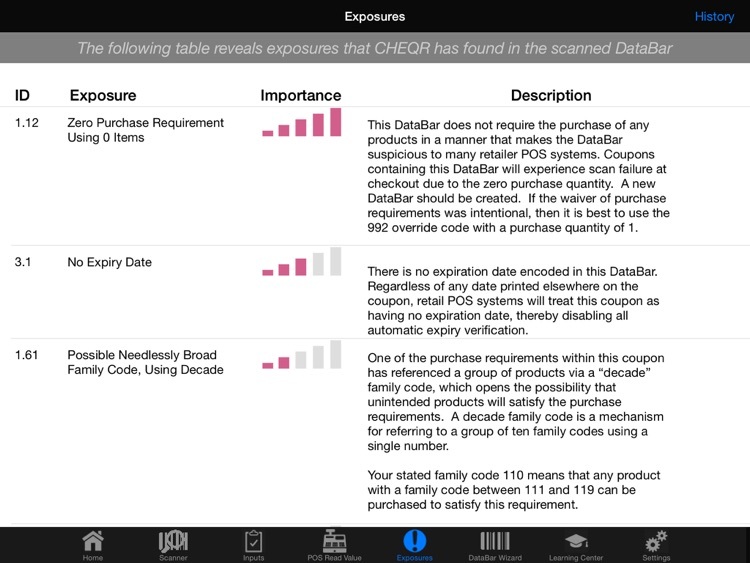 CHEQR educates users on the point-of-sale impact of each field value, thereby helping users improve offer designs and requirements in manners that DataBars can better support. •MIMICS POS Systems. CHEQR displays exactly how the DataBar will be interpreted by POS systems, providing incredible insight into the reasons that a coupon might be accepted for unintended purchases and rejected for fully compliant purchases. •IDENTIFIES Errors and Improvement Areas. CHEQR evaluates each DataBar, using proprietary algorithms to identify correctable errors and concerns. 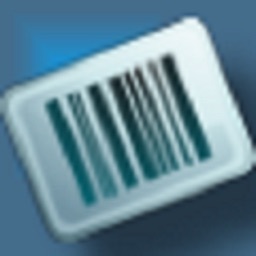 CHEQR suggests best practices in DataBar settings that can minimize coupon misredemption. •STORES Coupon Images. CHEQR retains a scanned image of each coupon to simplify the editing process, management of market-specific offers, FSI production, cost accounting, risk management, and a wide variety of coupon-related jobs. •IMPROVES Checkout Efficiency. 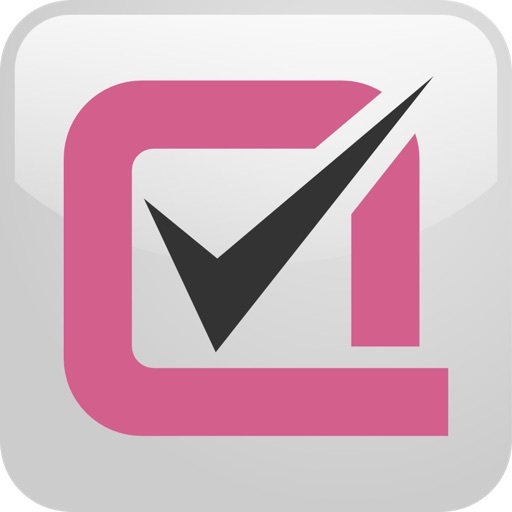 CHEQR is an ideal support tool for retail and processor line managers. CHEQR can enhance cashier training, resolve conflicts between written coupon terms and DataBars, prevent bottlenecks caused by DataBar problems, and address potential charge-backs proactively. •NEEDS No Setup or Connectivity. CHEQR is as portable as your device, designed to operate on iPads without any network or mobile connectivity. CHEQR is a corporate security dream: it doesn’t require any user inputs nor does it transmit any data anywhere. CHEQR’s intuitive design makes its ready to use straight from downloading, but if you need it, there’s a quick in-app tutorial. 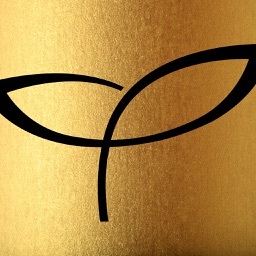 CHEQR is the creation of a team including Wharton MBAs, who are also brand management veterans, and senior iOS-development engineers from Georgia Tech and Duke University. 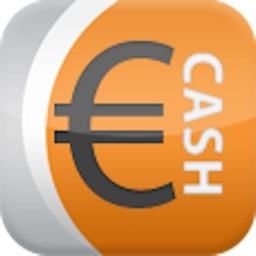 The app is designed to work exclusively on the iPad and only with the new North American coupon application encoding standards.